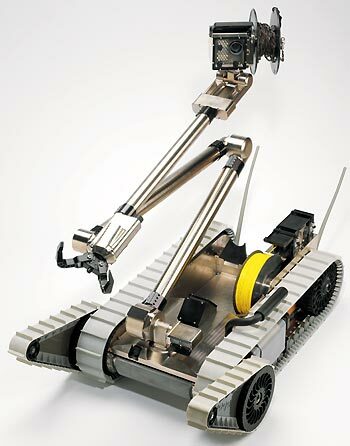 The PackBot Scout, PackBot Explorer and PackBot OED are small (25 pound), remotely operated robots that can be carried by a single soldier. They are made by iRobot, the same company that brought us the Roomba vacuum cleaner. These three robotic devices are called SUGVs - Small Unmanned Ground Vehicles - pronounced "sug-vee." They are designed to carry different payloads to help soldiers detect biological and chemical weapons, identify targets, go inside buildings to find snipers, and find hidden explosives. One robot has already been blown up, doing what would have been a soldier's job if there had been no robotic help. This technology is part of the Future Combat System (FCS) program which includes unmanned planes, self-propelled artillery and robots.